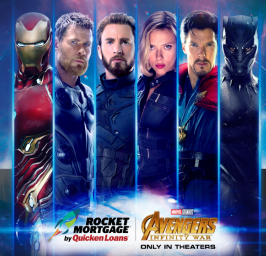 Quicken Loans Countdown to Infinity War Sweepstakes & IWG – Win $4,000! ELIGIBILITY – The Countdown to Infinity War Sweepstakes is open to: legal residents of the fifty (50) United States and the District of Columbia, who are at least eighteen (18) years of age or older, all at the time of entry. SWEEPSTAKES ENTRY PERIOD – The Sweepstakes begins on April 2, 2018 at 10:00:00 a.m. Eastern Time (“ET”) and ends May 18, 2018 at 5:00:00 p.m. ET. PRIZES – Grand Prize (1): One (1) Grand Prize winner will receive one (1) $4,000.00 check made payable to the winner. Approximate Retail Value (“ARV”): $4,000.00. Instant Win First Prize (10,500): Ten-thousand five-hundred (10,500) Second Place instant winners will receive one (1) Fandango Promotional Code. ARV: $15.00. Instant Win Second Prize (100): One-hundred (100) Second Place instant winners will receive one (1) film poster. ARV: $15.00.